Quinoa tabbouleh dressed in pomegranate dressing and topped with grilled halloumi, maple roasted carrots, tangy pickled cabbage, and topped with a buttermilk-avocado sauce. Combine the quinoa, parsley, tomatoes, mint, red onion, green onion, and cucumber. Combine Hellmann's® Creamy Ranch, lemon zest, garlic, and pomegranate juice in a bowl. Slowly whisk in olive oil. Add salt and pepper to taste. Add ‘Pomegranate Dressing’ to Quinoa Tabbouleh, combine well, cover and refrigerate until ready to use. Combine carrots, olive oil, maple syrup, salt, chili flakes, and nigella seeds in a bowl. Roast carrots on a lined baking sheet at 425°F, for 10-12 minutes, or until tender. Bring together in a saucepan the vinegar, sugar, water and salt to boil. Stir until sugar dissolves. Pour mixture over cabbage; stir to combine. Cover and let stand for 1 hour. Drain. Combine Hellmann's® Creamy Ranch, garlic, Hellmann's® Real Mayonnaise, lemon zest, and avocado in a bowl. Mix until consistency is smooth. Prepare Halloumi by searing sliced in a non-stick sauté pan, until browned on both sides. 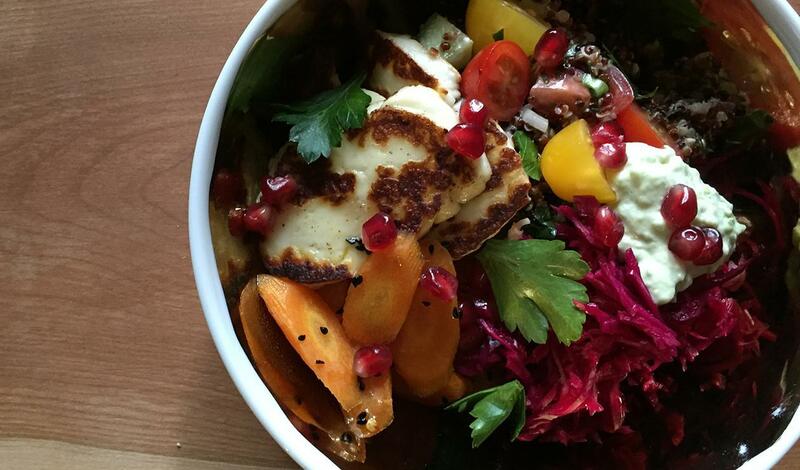 Build bowl by dividing components for 10 portions and add dressed quinoa mixture topped with carrots, pickled cabbage, halloumi, parsley, pomegranate seeds and a dollop of Buttermilk-Avocado sauce.